The September photo contest winner is Manuel Garcia! Great catch! After a long drought and no rain in site this past summer, fishing was slow. September came around and so did the rain. 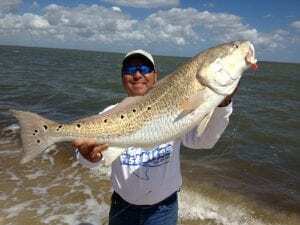 Hoping the fresh water would bring in the fish I packed up my fishing gear this past weekend and headed to Baffin Bay with my favorite bait ” the pink colored EZ crab” It didn’t take long for me to land this beautiful catch and release 25lb 38″ 11 spotted Bull Red! Thank You Fishbites! Your the Best!! Here are some other photos that we collected this last month, enjoy!